Cathy's Cuppa: 70/30 Water for coffee. That's parts per million. It's a recipe for water that's supposed to be good for brewing coffee: Water containing 70 parts per million of bicarbonate, and 30 parts per million of magnesium sulfate. 70/30 water. Now, I'm blessed with tapwater that's pretty good for coffee, despite being very, very, VERY hard. As in, off the scales of my hot tub test strips hard. Somewhere over 250 parts per million hard (the test strips stop at about 250 ppm), and that's AFTER the water softener does its job. (I know the instant it is out of salt, because my dishwasher starts sprinkling powdered chalk all over my clean dishes). So, for years, I've wondered if distilled water would be good for brewing coffee. Distilled water is "thirsty," because it's a better solvent than hard water. Then I came across the above URL and I knew I had to try it. Because you are working with such tiny quantities (as in 1/100ths of a gram), you have to make solutions first. 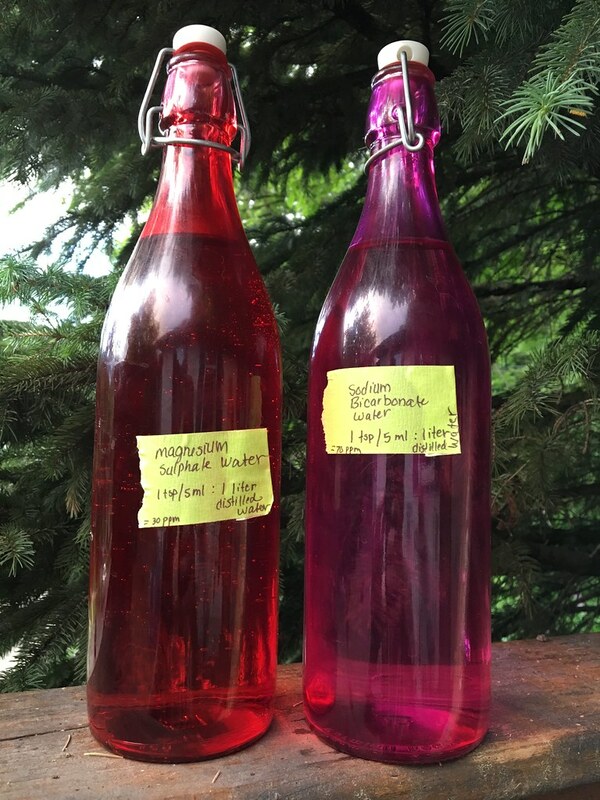 Twelve grams of magnesium sulfate (Epsom salts) dissolved into 1000 ml of distilled water, and 14 grams of baking soda dissolved in 1000 ml of distilled water, and you have the solutions needed to make 70/30 water. Once you have that, you add one teaspoon of each solution to 1000 ml of distilled water. That's pretty soft. We'll see if I like it. That's right. After removing 2 liters, I still had 1.78 liters. I actually poured it into a measuring container - yep. The company producing that gallon really measured quite precisely, and really did have 1.78 liters left over. I pretended it was 1.75 for math purposes. That jug now has 1.75 teaspoons of each of the solutions in it. And tomorrow, it's becoming coffee. Oh, and what's with the expiration date. Distilled water expires??? Based on the PDF of 70/30 water, the TDS for Magnesium 12g comes to 60 ppm or 60mg/l and not 30. The way to get 30 ppm would be to use 6g of epsom salt. Am I wrong in my calculations? I don't have enough knowledge of chemistry to be able to check their math, unfortunately. My guess is that weight of the epsom salts don't equal TDS in the way you are expecting, that they are less concentrated (?) for the weight than bicarbonate. Epsom salt = Epsomite = MgSO4·7H2O. If you take 12 g of MgSO4·7H2O, you really get 1.184g of Mg++.